Koye's Blog: Which of these Harpic 'adverts' do you think is more effective? Which of these Harpic 'adverts' do you think is more effective? Imagine a young woman in her early thirties. It is a Saturday morning and she is home with her family. Her husband is making breakfast and she is roughhousing with her child. Her phone rings, and it is her mother-in-law (MIL) on the other end. MIL is sorry for the short notice, but she has missed them and is visiting today. She gets off the phone and springs into action. She and her husband dash around the house straightening out the rug and putting toys away. And then she remembers the ghastly stains in the guest toilet. Damn! She dashes into the toilet with a box of detergent and half-empties it into the toilet bowl. She flushes after minutes of scrubbing but the stains remain, seeming to mock her. Her husband pokes his head into the toilet long enough to hand her a bottle of Harpic. She repeats the same motions as before, with a different result this time. Her toilet is sparkling white! Her MIL visits and has fun hanging out with the family. When the MIL heads for the toilet at some point, our young woman and her husband glance at each other and share a knowing smile. A voiceover recites Harpic’s claim while it flashes across the screen, stating it is much better than detergents at fighting stains and germs. Imagine a young woman in her early thirties. She is going about her business in her home when someone knocks on the door. No other family members are around or in view. When she opens the door, it is a celebrity she recognizes, accompanied by a video recording crew. Oblivious to the presence of the crew, she hugs the celebrity excitedly and screams. The celebrity invites herself into the house, saying something like “I am here to check if your toilet is completely clean”. Alternatively, the celebrity sashays into the house and begins assigning numeric scores equivalent to the cleanliness of the different rooms. Inevitably, the toilet bowl fails the cleanliness check. The celebrity proceeds to educate the homeowner, informing her that detergents cannot remove tough stains or kill germs. 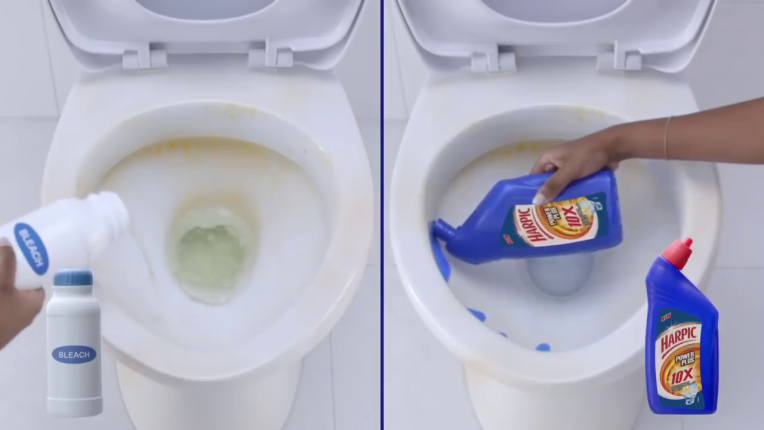 She then applies Harpic, and the screen splits into two to show the difference in results when a toilet is cleaned with Harpic and when it is cleaned with a regular detergent. Of course, Harpic is so much better at delivering sparkling white toilet bowls. The homeowner expresses surprise at how clean her toilet is, and affirms that she will only use Harpic in the future. I am not an advertising expert. I got thinking about this a few days ago when I saw an advert for Harpic shortly after reading about the use of stories in effective communication. Harpic adverts have mostly followed a template similar to (2) as long as I remember. RB is a great consumer goods company with many successful brands, so they must understand advertising. All things being equal, they have stuck with this template because it works. I can think of pros and cons for both ad-forms above. In the first one, it takes too long to get to the brand and you risk losing consumers who don’t stick around past the first few seconds. Clever editing may be able to make up for this. The scenario in the second ad is unbelievable, but it hits you on the head so many times with the brand that I guess it just sinks into your subconscious. I am curious, and I now invite you to help me. If the purpose of advertising is to build awareness of brands, include them in your consideration set, and potentially increase your intention to purchase them, which of the above would be more effective? The “story” in (1) focuses on a woman because women are the target market for Harpic advertising in Nigeria. I clean my toilets. The book I was reading in (3) is Made to Stick: Why Some Ideas Survive and Others Die. See some responses on Medium.